Our Vita Review Gets 5/5! Good coconut water is simple to describe. It tastes like fresh coconut water. It has no additives. It has no strange after tastes. I’ve been a coconut water enthusiast for a while and tried a lot of different brands with varying levels of success. I even got my husband to start enjoying them. He thinks coconut water tastes bland and stale, so generally he opts for flavors. Even with our differences we came out with the same favorites. I hope this helps you choose the coconut water that you’ll be the happiest with. 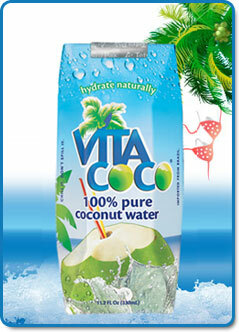 Vita Coco tastes so close to the fresh coconut water, I can’t tell the difference. It has the consistency of fresh coconut water. It’s delicious. Out of all the flavored coconut waters my husband has tried, he drinks the most of the tangerine Vita Coco. He says the pineapple is ok, but I only ever remember seeing him drink it once or twice. O.N.E. Coconut Water is also delicious. The same great refreshing taste of coconut water, until the end. It has this aftertaste. Albeit not unpleasant, just more of an aftertaste than Vita Coco. I looked at the box and found that it was pasteurized. It didn’t explain the process and the other brands didn’t mention it, so I assumed this was the reason for the aftertaste. If my husband decides to drink pineapple coconut water it is usually from O.N.E. Evidently its sweet, but not too sweet. Harvest Bay Coconut Water doesn’t have the flavors that Vita Coco and O.N.E. do. It’s less rich, and although in the beginning I found this a little disappointing, it was exactly what I wanted when I was parched. I’m hesitant to say it taste like its been watered down, because although it does, this is the only coconut water my husband will drink without a flavor. I think that says a lot. I didn’t understand why sometimes Zico was amazing and others it left a lot to be desired until I did some research. Never buy the 14 oz bottles. Never. Coconut water from concentrate does not taste fresh. Added artificial flavoring does not taste like coconut water. I hope this saves you the disappointment I had. Google around and you’ll find out that Coca Cola bought them and since they’ve made some poor decisions. But, the 11 oz carton is heavenly. If hubby wants to drink mango coconut water, he chooses the Zico brand. It’s supposed to be sweet and refreshing and hides the “feet” taste well. How did I end up with him again?